one of the wonderful joys of having an abudance of plant life is the fact that there are some species of plants that flourish without me making any effort. impatiens are just that sort of easy to grow annual. i have planted a few over the years. but for the most part they reproduce all on their own. these shade & water loving plants find their way into existing potted plants and into my flower beds-- literally in mass. sometimes I actually (gasp) pull them up because they shoot up in random unwanted places. 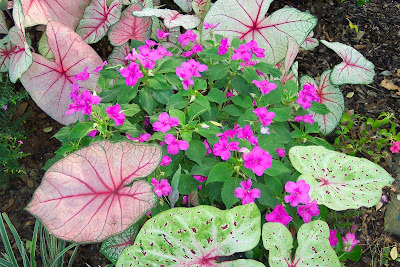 impatiens are most prolific in the spring and fall because they really prefer the cooler nights and milder days. they do tend to get too tall and leggy in the summertime. i have already pruned almost all the impatiens back that came up this spring. not to worry, they will come back and they will ‘make babies’ in an array of unplanned variety of colors. i like the "selah du jour" addition and the photo above it. I too like the additions to the blog. It is odd that you have things grow without any effort, while it takes great effort and determination for me to do anything of the sort. jane: just to clarify... these flowers started without effort but to make them grow takes some attention - especially with our drought this year. i had to be so diligent to hand water this spring- it actually made everything look nicer than usual- go figure. i see i am going to have to track you down 'off-blog' for the trivia reveal. i'll have to add mysterious-ness right under random-ness on the list of jane characteristics. Did you know that it is impossible to lick you elbow? Did you know that everyone who just read that will try? Did you know that four humingbird eggs would fit on a penny? My favourite comebacks are my bat-faced cupheas. They don't make babies, but have come back from the roots for the last 4-5 years. Re the shop in Lutz... it's been too many years, so I can't remember the name. Just that it was in a shopping center on 41 and there was a restaurant of some sort in the front parcel. sophiemae: i had to google bat-faced cupheas to even know what they are. shows how much i don't know. :-)they are unique in color and design- i can see why the name bat faced. I think you have two great advantages for your gardening, lots of space and lots of shade. It is so limiting on a suburban lot to have spacious beds. 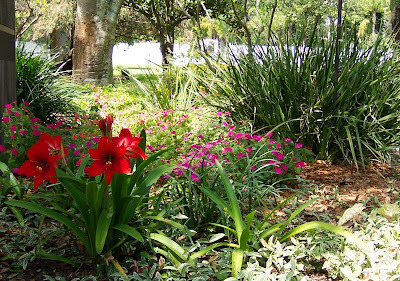 If you have no trees, the hot Florida sun is unmerciful for so many plants and flowers. Even the grass needs continuous care to stay looking good without some shade. 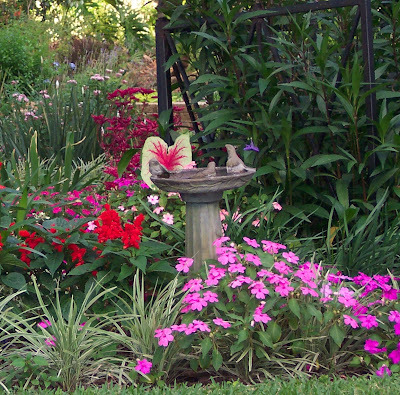 Partial sun is best for most gardens, otherwise, you must use heat tolerant plants and shrubs. Can you suggest some of those for us less fortunate gardeners? I like the visual appeal of your garden, but I think is is because it seems to have an orderliness along with a kind of randomness. I mean, it isn't exactly xeriscape, with stuff just sticking here and there. It has definition, outlines, designated plantings along with variety in all the beds. It is like a kaleidoscope of color everywhere, but not distracting or confusing. I don't know if that is clear or not, but you can sense the purpose and plan in the outcome, while it also seems to have just the right composition of this and that in a kind of not too formal result. Like it all just happened somehow, without too much effort put into it. It is obvious that could not be true, but your garden seems to be unique in that way. sg: trees were a 'must have' when we were shopping for this house. i've always felt like my yard started with great bones- those being the abundant oak trees and the palmettos - so florida (which i love). i actually took out a tree last year so i could have one corner of my back yard to put all the sun-loving plants i had yet to buy in.